I love this ornament project because it uses items I had leftover from other craft projects (recycled). It was a way for me to spend quality time with my daughter while we created this unique ornament. 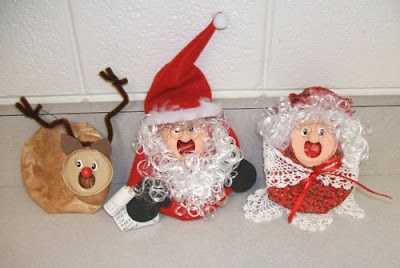 We even took it a step further to create a crushed can Mrs. Claus, Rudolph, and the other eight reindeer. These ornaments, along with a few red Christmas balls and some bows, was enough to decorate a small tree for very little money! All of these supplies can be purchased at a local craft store and/or hardware store. Apply primer to top of can (the face) and allow to dry. Paint inside of can opening red for the mouth. Paint face and wooden peg with flesh (or peach) acrylic paint. Use white acrylic paint to add two oval eyes, and use black acrylic paint for the ovals inside the eyes (pupils). If desired, apply some cosmetic blush to his cheeks using a cotton swab. For the nose, center and glue wooden peg just above the can opening. To cover the can, fold down one edge of the 10-inch felt square about one inch. Glue folded edge of felt along outer edge of face, overlapping ends of folded edge at top. Wrap remaining felt to back of can and glue to secure in place. For hair and beard, glue some white curly doll hair on forehead and around face, placing more at the bottom for the beard. For hat, cut a triangle from the 8-inch felt square that measures approximately 7 1/4 inches along each side. Overlap the two side edges of the triangle about ¼ inch and glue to secure. Glue pom pom to point of hat and glue trim to hat edge. Place hat on Santa with seam at back. For mittens, draw two mitten shapes that are two inches long and 1 1/2 inches wide onto black felt and cut out. Glue mittens to each side of Santa. For Santa’s list, use a black felt tip pen to write names on paper strip. Wrap each end of list around a pencil to curl slightly. Glue list to one of the mittens. To make his glasses, loop wire into a circle about 1 1/2 inches from each end of wire. Bend ends of glasses to fit face. Use wire cutters to trim off any excess, if necessary. Place glasses on face and glue to secure. 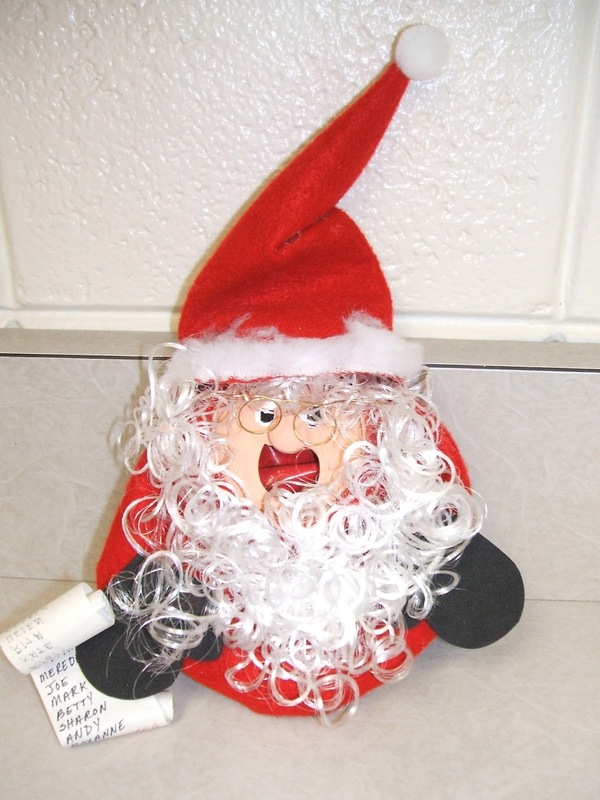 To hang Santa, push the end of a regular ornament hook into felt on back of Santa.